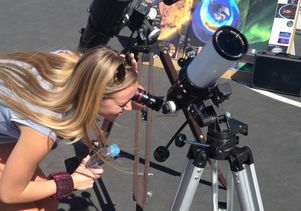 UCLA will have specially filtered solar telescopes that protect the eyes while revealing stunning details of the sun. Will you be in Southern California for the solar eclipse on Aug. 21? If so, you can see the “Great American Eclipse” at a free event hosted by UCLA scientists, who will be on hand to answer questions about the eclipse, and that will also include filtered telescopes for viewing the spectacular phenomenon. People in Los Angeles will be able to see a partial solar eclipse, as long as clouds do not obstruct the view. UCLA’s public event will be run from 9:30 to 11:30 a.m. on Monday, Aug. 21. The maximum point of the eclipse will be at 10:20 a.m., when the moon will obscure about 60 percent of the sun. At 11:44 a.m., the moon will complete its journey across the sun. The event will be held at the campus’s Court of Sciences (map). UCLA will have specially filtered solar telescopes that protect the eyes while revealing stunning details of the sun, such as enormous clouds of ejected solar material, and surface features such as sunspots, which can be larger than the Earth. There will also be live images of the solar eclipse projected onto a white screen that will enable participants to take eclipse photos. 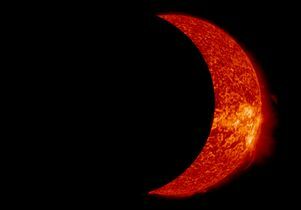 UCLA scientists in astronomy and planetary sciences will be available to answer questions about the sun, the eclipse, the solar system and astronomy. A limited number of eclipse glasses will be provided. Viewers of the total eclipse (unfortunately, not those in California) will be able to see the sun’s atmosphere and the solar wind, a stream of energized particles that permeates our entire solar system, as long as the weather permits. The event is co-sponsored by the UCLA Department of Earth, Planetary and Space Sciences, the UCLA Institute for Planets and Exoplanets, and two UCLA student groups: Astronomy Live! and a joint organization of the Optical Society of America and the International Society for Optics and Photonics. The event will be streamed live on the UCLA Facebook page, with Earth, planetary and space sciences professors answering questions from those who watch along. Viewers are invited to post on social media using the hashtag #UCLAeclipse. Be sure to never look at the sun — including during Monday’s eclipse unless you have special eclipse glasses. Looking at the sun can cause serious and permanent damage to the retina of your eyes. Here is more information about safely viewing the solar eclipse. NASA image of a partial solar eclipse.